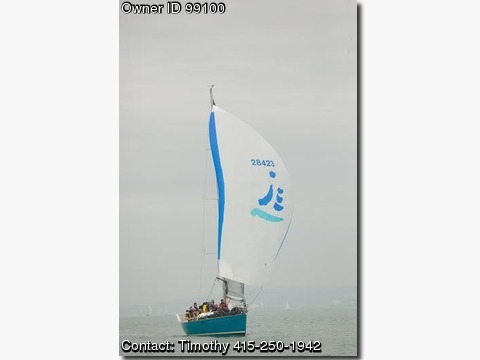 Please call boat owner Timothy at 415-250-1942 or 415-454-8000. Boat is located in Tiburon, California.. Replaced diesel engine in 2009. Removed, disassembled, inspected and re-assembled mast/standing rigging 2009. Custom designed/built arch coning tower. Oversized Main car and rail system. Oversized Spinnaker pole car and rail system. Spinn pole, two: one Carbon fiber and one aluminum with assembly for two pole gybe. Forestay systems, two sets: one tuff-loft and one roller furling. Spare parts and equipment include: EPIRP, MOB pole, rescuer gear, emergency rudder, emergency tiller, etc. Service and repairs- Diesel engine: replacement was done by LIST MARINE with 50 hour services thereafter. Hull and rigging: KKMI exclusively. Sails: Main sails, two carbon: One light carbon Doyle; one carbon HD. Spinnakers: Shy, VMG, Runner and a 125 oz full cut. She has cruising Dacron roll head and main. Race record: 2004 Winner of Pacific Cup, Division "C" from SF to Hawaii. 2007 Placed 5th in Trans Pacific Cup, from LA to Hawaii. 2003-2011 Rolex Big Boat regattas with one 2nd place and two 3rd places. 2003 - today IRC, PHRF and ORYA including Mid-Winters, coastal and in the Bay: lots of awards.